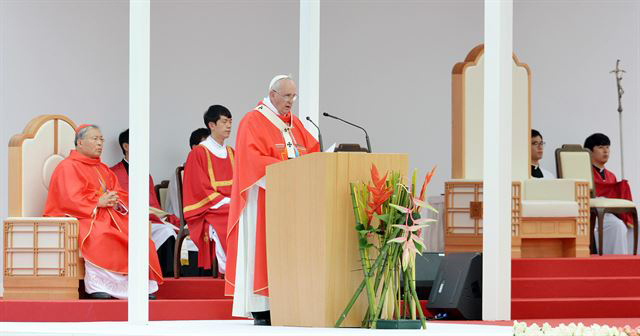 Milford, NH – Earthworks FlexMic™ podium microphones were recently used in a Beatification Ceremony conducted by Pope Francis in Seoul, Korea on August 16. The ceremony was held at Gwanghwamun Square in central Seoul, with nearly one million people in attendance and 20 percent of South Korea’s population tuning in to watch the historic event on television. Sung Jun Park, Director of Engineering for Art Mix, selected six FMR500/HC 19 inch Earthworks podium microphones for the ceremony. For this particular ceremony, Park utilized J-Series and Q Series loudspeakers from d&b audiotechnik, a DIGICO SD-8 console and six Earthworks FMR500/HC podium microphones.